Attorney General Jeff Sessions must fight crime at the same time he’s draining the FBI swamp. Thank you Chuck [Canterbury], for that kind introduction, and for your long and faithful service as National President of the Fraternal Order of Police (FOP). On behalf of President Trump and the Department of Justice, I’m honored to be here with you today. The Fraternal Order of Police serves a critical purpose: to support those who protect us. And today, as many of your members and our law enforcement partners continue to work tirelessly in Houston to rescue those affected by the catastrophic flood waters in Texas, I’d ask each of us to lift them up in our prayers. As the water continues to rise, these men and women are leaving their homes and their families to put on the uniform and serve their communities. This is the work that police officers do day in and day out—no matter where the danger comes from, you are there to serve and protect. I know firsthand the important work that each of you do. I was a federal prosecutor for 14 years, and I was blessed to work every day with federal, state, and local law enforcement officers – many of them members of the FOP – to fight crime and defend the lives and liberties of Americans. I know that each of you has that kind of impact in your communities. But your work is hard, and in many places it’s getting harder. That’s because we are fighting a multi-front battle: an increase in violent crime, a rise in vicious gangs, an opioid epidemic, threats from terrorism, combined with a culture in which family and discipline seem to be eroding further and a disturbing disrespect for the rule of law. After decreasing for nearly 20 years because of the hard but necessary work our country started in the 1980s, violent crime is back with a vengeance. The murder rate surged nearly 11 percent nationwide in 2015 – the largest increase since 1968. Per capita homicide rates are up in 27 or our 35 largest cities. Drugs are killing more Americans than ever. Preliminary data shows that nearly 60,000 people died from drug overdoses in 2016. Not only is that the highest drug-related death toll in our history, but it is also the fastest increase in drug deaths we’ve ever seen. For Americans under the age of 50, drug overdoses are now the leading cause of death. Nashville isn’t immune to these problems. This wonderful city saw a 76 percent increase in murders between 2014 and 2015 and a 120 percent increase in fatal opioid overdoses in 2016. These numbers are shocking—but they aren’t just numbers. They represent moms and dads, brothers and sisters, neighbors and friends. I know your own mayor is mourning the loss of her son to this deadly plague. Many in this room have felt this loss firsthand as well. 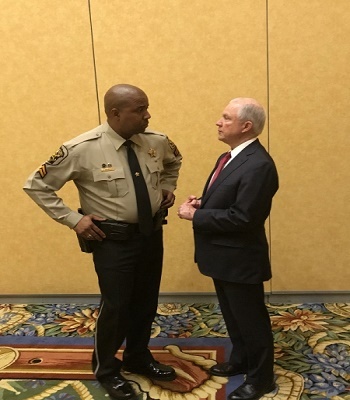 Sessions discusses law enforcement issues with one of the FOP conference attendees. Law enforcement officers like you face these tragedies every day. You are the thin blue line that stands between law-abiding people and criminals—-between sanctity and lawlessness. You protect our families, our communities, and secure our country from drugs and violence. The vast majority of our country appreciates what you do. In fact, just a few weeks ago, Gallup released their annual poll, which showed that overall confidence in the police has risen to 57 percent this year. That is a testament to the work you do every day. But some would undermine this support by portraying law enforcement officers as the enemy. 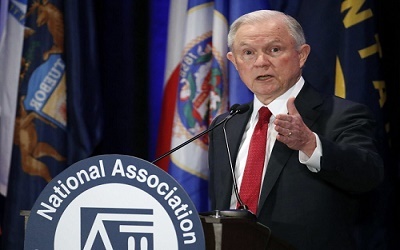 Instead of recognizing that the Justice Department vigorously prosecutes officers in the cases when they violate the civil rights of our citizens, they choose to slander all of the honorable men and women in law enforcement who serve every day with professionalism, integrity, and selflessness. Their divisive rhetoric treats police officers like the problem, instead of the crucial allies that you all are. So it can come as no surprise when we see rising levels of violence against law enforcement. Last year, 66 law enforcement officers made the ultimate sacrifice in the line of duty – a 61 percent increase compared to 2015. And FBI data shows that about a third of those deaths were the result of premeditated or unprovoked attacks. This deadly trend seems to be getting worse. Preliminary data shows that officer deaths for the first six months of 2017 are up 18 percent. We saw just this type of tragic violence a little over a week ago, when six officers were shot in a single night. Two of them – Sergeant Sam Howard and Officer Matthew Baxter, of Kissimmee, Florida – lost their lives. And just last month, Officer Miosotis Familia, a 12-year veteran of the NYPD and mother of three, was gunned down in cold blood by an assassin while sitting in her police van. She was doing her job. And yet she was unjustly targeted in an act as vicious as it was cowardly. We pray for our lost brothers and sisters, we do all we can to support their grieving family and friends, and we vow to do all in our power to further our resolve to protect, respect, and preserve law enforcement. Every American should appreciate—and celebrate—the work that you do and the sacrifices you make. And this President stands with you—not just rhetorically—but in thought, word, and deed. President Trump sent the Department of Justice three executive orders after I was sworn in. He sent us the ‘back the blue’ order to support our law enforcement at all levels. The second made it our objective to “reduce crime” across the country. And the third requires us to dismantle transnational criminal organizations. Several months ago now, we changed the charging policy for our federal prosecutors, trusting them once again and directing them to return to charging the most serious, readily provable offense. In July, we reinstituted our equitable sharing program, ensuring that criminals will not be permitted to profit from their crimes. As President Trump knows well, civil asset forfeiture is a key tool that helps law enforcement defund organized crime, take back ill-gotten gains, and prevent new crimes from being committed, and it weakens the criminals and the cartels. Civil asset forfeiture takes the material support of the criminals and instead makes it the material support of law enforcement. In departments across this country, funds that were once used to take lives are now being used to save lives. Since these changes, we have seen a 23 percent increase in the number of criminals charged with unlawful possession of a firearm. The Department has convicted more than 1,200 members of gangs, cartels, and their subsidiaries, since the beginning of the year. While I’m proud of the work that the Department of Justice has done, we have not done it alone and can never hope to do it alone. 85 percent of law enforcement officers are state, local, or tribal. This is your work. These are your well-earned successes. 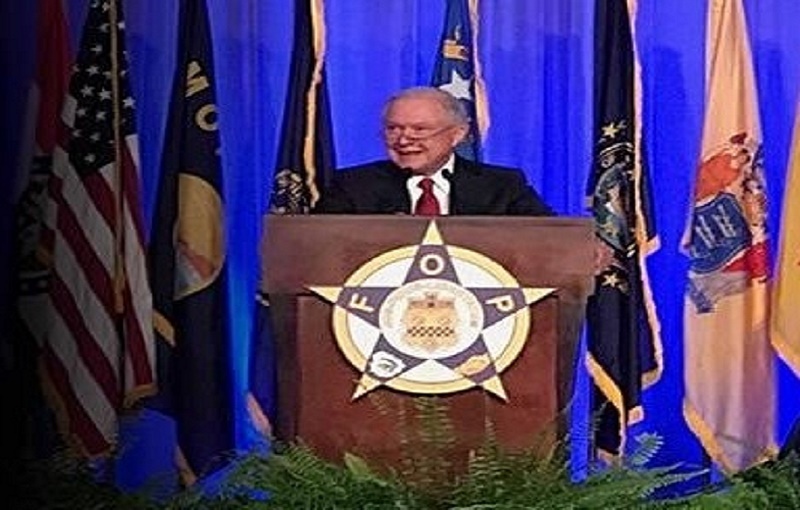 Helping law enforcement do their jobs, helping the police get better, and celebrating the noble, honorable, essential and challenging work of our law enforcement communities will always be a top priority of President Trump and this Department of Justice. We will always seek to affirm the critical role of policeoffers in our society and we will not participate in anything that would give comfort to radicals who promote agendas that preach hostility rather than respect for police. President Trump is serious about this mission. He is doing all he can to restore law and order and support our police across America. And that is why, today, I am here to announce that President Trump is issuing an executive order that will make it easier to protect yourselves and your communities. He is rescinding restrictions from the prior administration that limited your agencies’ ability to get equipment through federal programs, including life saving gear like Kevlar vests and helmets and first responder and rescue equipment like what they’re using in Texas right now. Some of these programs, like the Department of Defense’s 1033 program that Congress signed into law more than 25 years ago, have recycled more than $5.4 billion in used gear and equipment that taxpayers had already purchased, and made it available for your agencies to repurpose it in the fight against terrorism, crime, and disaster relief. Equipment like helicopters and armored vehicles are also vitally important to emergency and disaster response efforts. 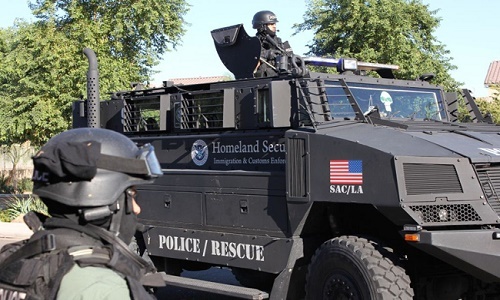 One sheriff told me earlier this year about how, due to the prior administration’s restrictions, the federal government made his department return an armored vehicle that can change the dynamics of an active shooter situation. These are the types of helmets and gear that stopped a bullet and saved the life of an officer during the Orlando nightclub shooting. This is the type of equipment officers needed when they pursued and ultimately killed terrorists in San Bernardino. Studies have shown this equipment reduces crime rates, reduces the number of assaults against police officers, and reduces the number of complaints against police officers. Those restrictions went too far. We will not put superficial concerns above public safety. All you need to do is turn on a tv right now to see that for Houstonians this isn’t about appearances, its about getting the job done and getting everyone to safety. The executive order the President will sign today will ensure that you can get the lifesaving gear that you need to do your job and send a strong message that we will not allow criminal activity, violence, and lawlessness to become the new normal. And we will save taxpayer money in the meantime. Roughly translated, the FOP’s motto means “Law is a Safeguard of Freedom.” I would go one step further by saying that rule of law is the safeguard of freedom. The law secures our God-given rights, and you – the officers who enforce it – ensure that all Americans enjoy those rights. The Department of Justice and the Trump Administration are proud to stand with you as you continue to do this honorable work.